World first for Vauxhall | What Car? 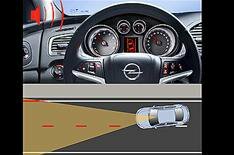 The Vauxhall Insignia is the first car in the world that can read speed limit and no-overtaking signs and display them on the instrument panel. It's all done through a camera, not much bigger than a mobile phone, mounted between the windscreen and the rear-view mirror. It has a wide-angle lens, so it can read signs at the roadside and centre lane markings simultaneously, and can take 30 pictures a second. Depending on the available light, it begins to read road signs from a distance of 100 metres, and when it recognises a number, it displays it on the instrument panel. No-overtaking signs are given priority over speed limits. The system, developed in partnership with lighting specialists Hella, also acts as a lane-departure warning system, giving an audible and visual alert if you inadvertently stray off course.